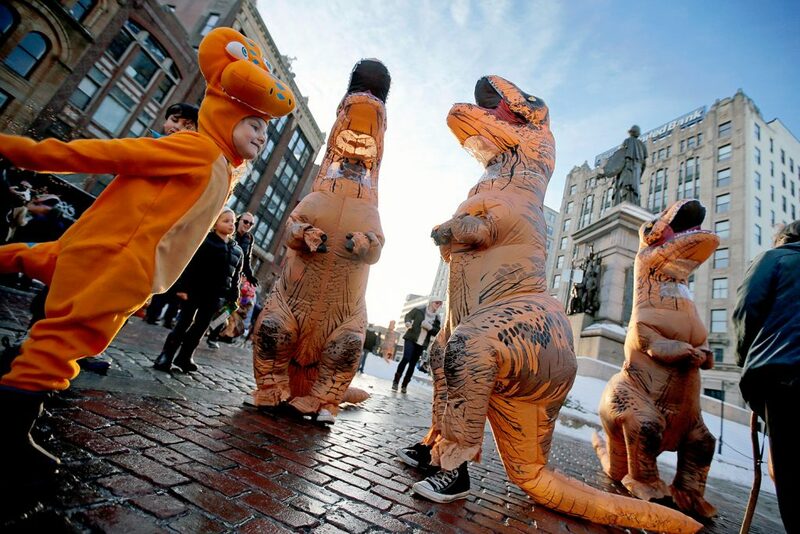 About three dozen people donning T. rex costumes attend the planned event and catch the attention of more than 100 onlookers. Why did the T. rex cross the road? On most days, the right answer might be because the chicken hadn’t evolved yet. Or to get to the other side of the extinction event. 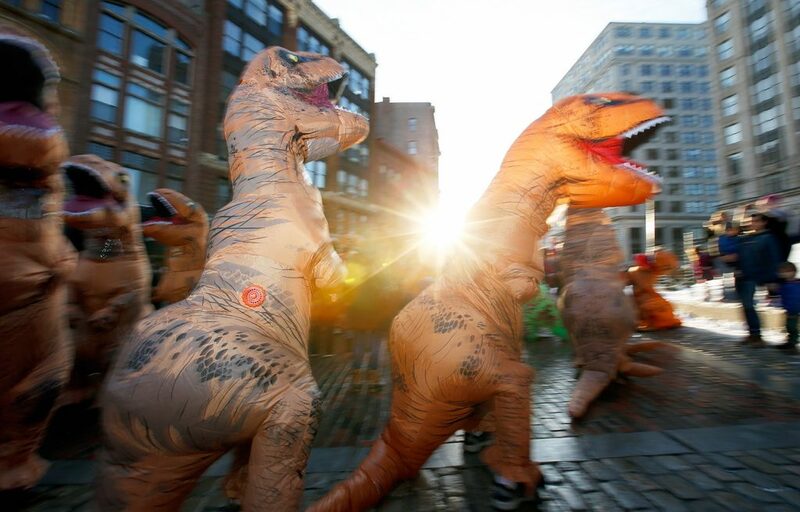 But on Saturday, any dinosaurs spotted in a Portland crosswalk would have been headed over to the T. rex gathering in Monument Square, of course. 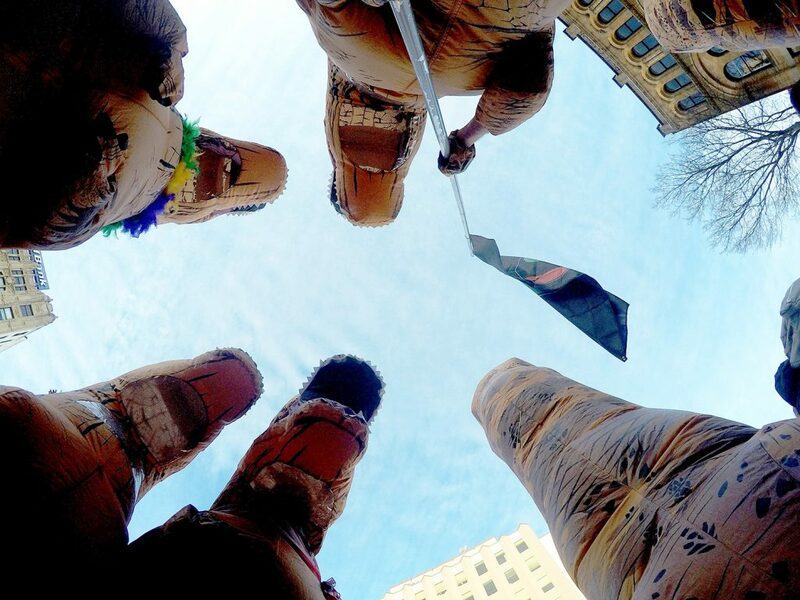 About three dozen people wearing T. rex costumes gathered at the foot of the Portland Sailors and Soldiers Monument to dance, laugh and generally be silly. 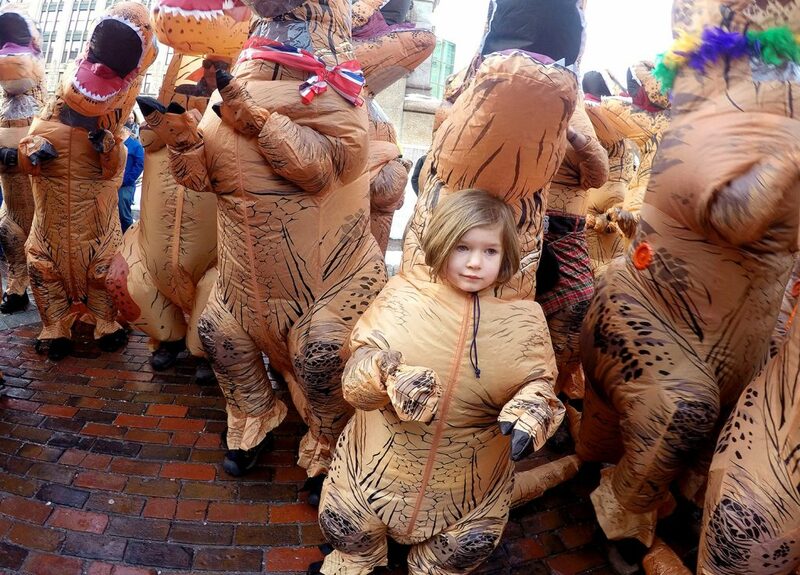 More than 100 bystanders looked on, snapping photographs of dino-suited friends and strangers trying to do a conga line to the Was (Not Was) song “Walk the Dinosaur,” without tripping over each other’s 3-foot-long tails or trampling awestruck toddlers reaching up to touch them. Kate Goldfield was headed to the library when she stumbled upon the Cretaceous Period dance party. 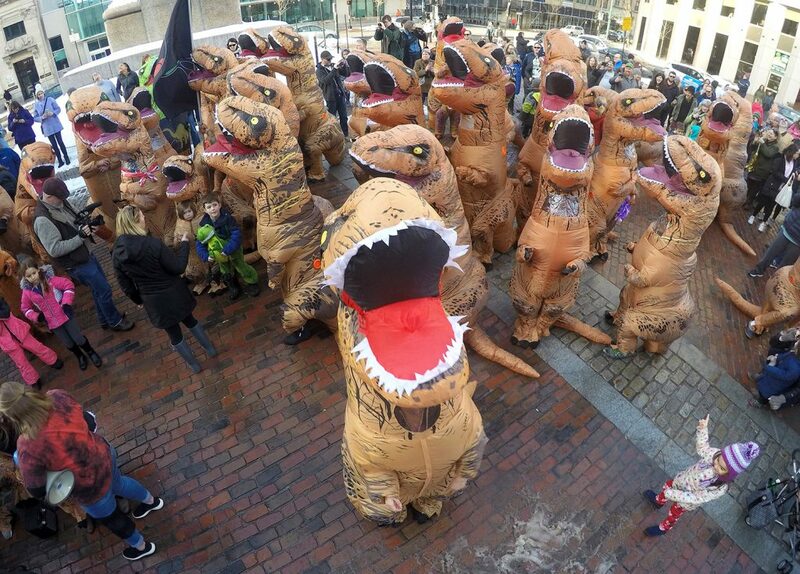 This Tyrannosaurus trend began about two years ago when fans of the 2015 dinosaur flick “Jurassic World” began showing up on line dressed up as their favorite dinos. That evolved into people posting videos of themselves doing everyday things in their T. rex duds, like walking the dog or shoveling snow. 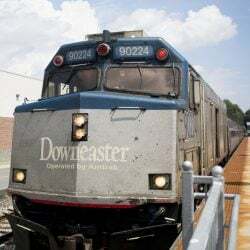 The organizers of Saturday’s event, Alison Cyr of Saco and Valerie Sanborn of Portland, decided to hold a meet-up to find like-minded dino-pals. 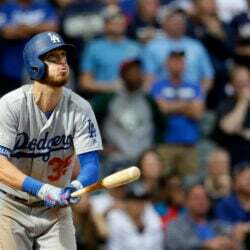 Sanborn was thrilled at the crowd. 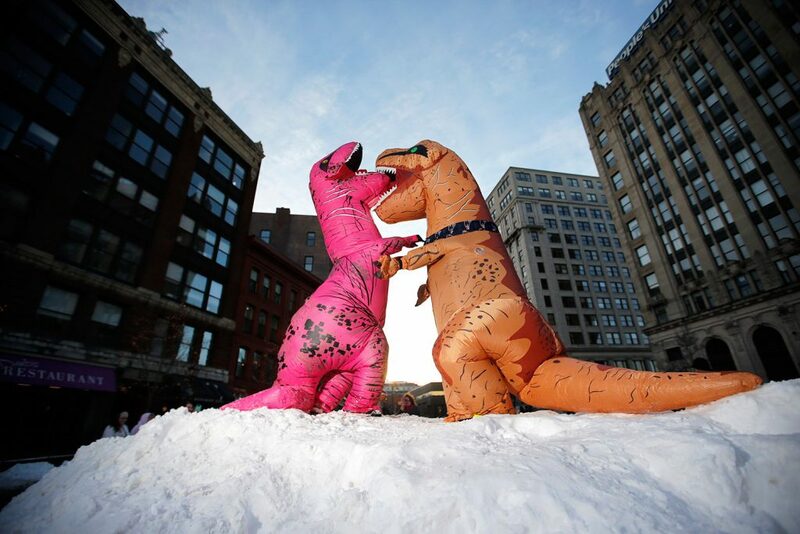 She and Cyr arrived at Monument Square early to prepare – it only takes about a minute to slip the costumes on and get the fans that keep them inflated going, but it can take a while to slip into that silly dino state of mind – and be there to greet anyone who got there early. They wondered if anyone else would even show up, despite the unexpected surge of interest from people on Facebook. By 3:15 p.m., a multi-colored throng of fellow T. rex’ers were waddling around the square growling and cracking extinction jokes through the see-through chest panels. A few came with extra props, like boas and tiaras, a political sign wishing extinction upon the president and a tag-along paleontologist. One Laura Dern wanna-be rode an inflatable dino. Inexplicably, there was one gorilla. But the T. rex theme prevailed, even if the species itself went extinct. 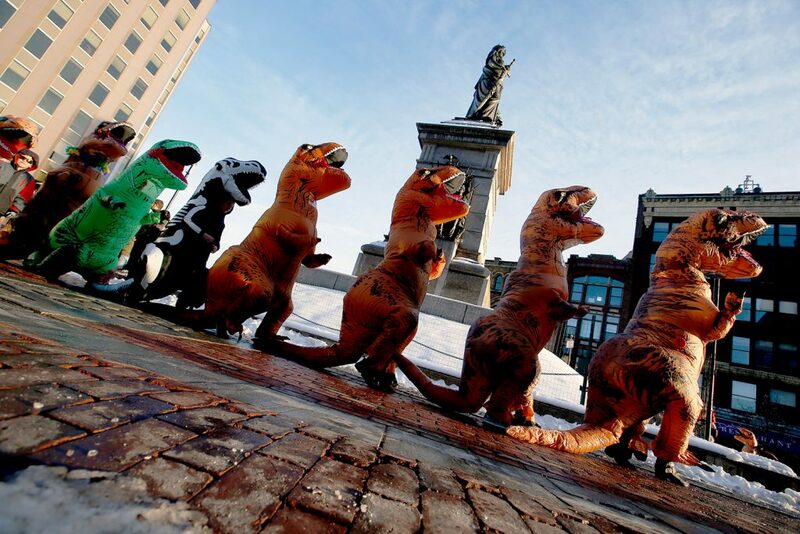 Vince Clark drove down from Orono with a couple of friends to try out their new T. rex costumes. 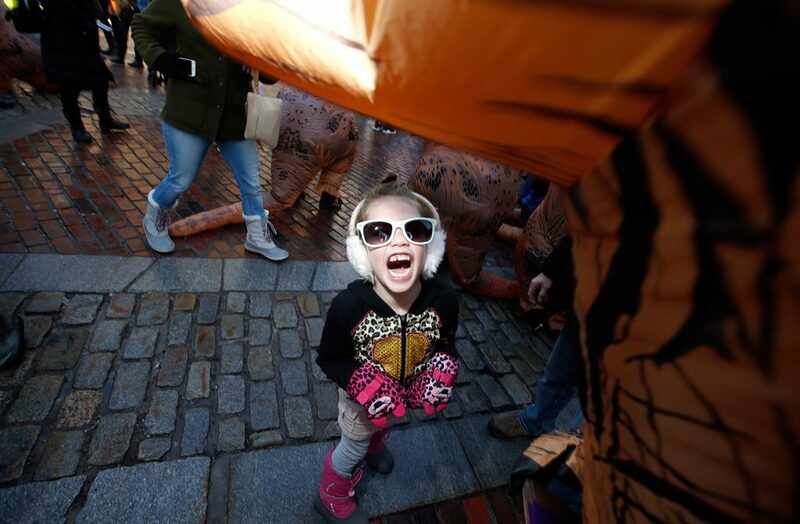 For Cyr, dressing up like a dinosaur makes her happy. It makes everybody around her laugh, which in turn makes her laugh. After a few minutes in the suit, the troubles of everyday life, like aging out of her parents’ health insurance plan, fade away. Sure, Cyr can be serious. And yes, she has a job. But the social media manager is a big believer in the healing properties of laughter, and the T. rex suit brings out the little kid in her. As Cyr’s fan jumped up and down, Cyr began to do the same, her short little dino arms waving and her long blow-up tail flopping around the slush.